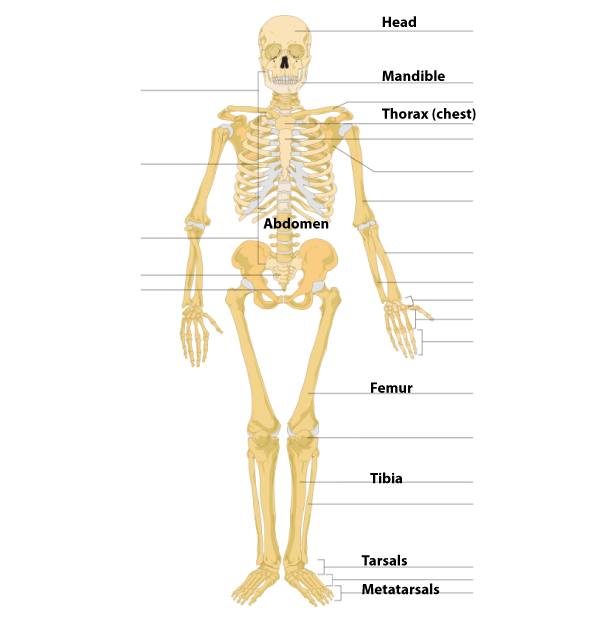 Yesterday we talked a bit about about the human skeleton. Now let's compare it to an insect skeleton. 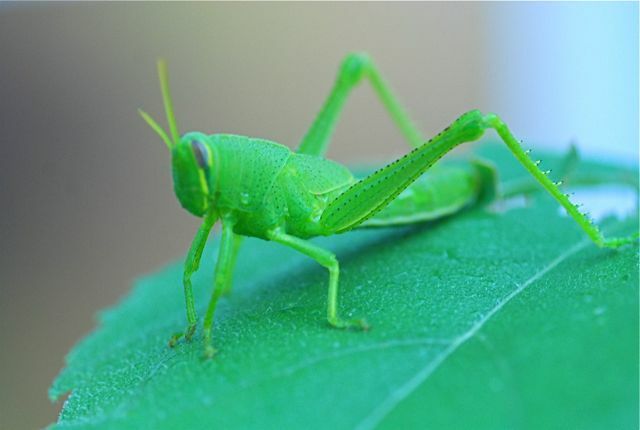 Insect and other arthropods have their supporting structure on the outside of their bodies. The outside skeleton is called an "exoskeleton." It has the same function as the vertebrate internal skeleton, that is protecting the internal organs and allowing for movement. The biggest difference is that the exoskeleton doesn't grow and must be shed or molted for an insect to increase in size. When you first look at an insect anatomy diagram, it might seem like the vocabulary is unusual. It turns out, however many of the parts are named the same as in humans. 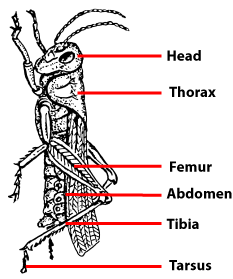 For example, the name of the segments of the insect's legs correspond to the names of the bones in the human legs. The big bone in the thigh is the femur, the bone below the knee is the tibia, and the bones in the feet are called the tarsals and metatarsals. A doctor of thoracic medicine specializes in the chest, particularly the lungs. A doctor might ask if you have a pain in the lower left abdomen. The human jawbone is called a mandible, and insects with biting mouthparts have mandibles. Insects have a membrane that helps them detect sounds called a tympanum. Humans have a tympanic membrane in the ear that helps with hearing. Learning the vocabulary is easier once you see the similarities. Can you find your femur? Can you see the large, jumping femur of this grasshopper?